Your shower is the crown jewel of your bathroom, so why not make it shine? 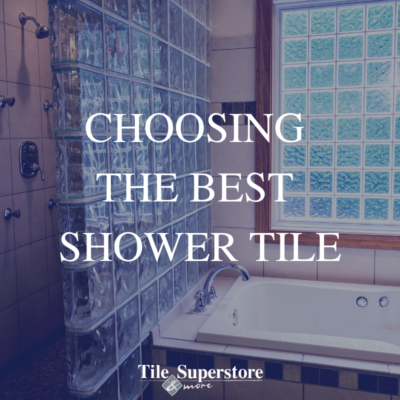 Here are our tips to help you choose the best shower tile to fit your needs! Approximately 234,000 people over the age of 15 suffered injuries in the bathroom that required an emergency room visit. Over 80 percent of these injuries were due to falls. Ceramic & porcelain tile provide a large variety of options that have slip resistant features in wet and dry conditions so that you can find the right type of tile for your shower. You may also want to consider using mosaic tile for your shower flooring, as smaller tiles with more grout lines can provide even more traction. If you require special features in your shower or bath area (such as a grab bar), the strength of installing on a ceramic tile area will give you peace of mind without compromising appearance. Choose ceramic or porcelain for your shower tile, which are ideal for areas exposed to water. This sounds obvious — of course, you want your shower and bathroom to be waterproof. When properly installed using appropriate methods and installation materials, a ceramic or porcelain tile floor or wall is waterproof, protecting against water that could otherwise ruin your construction underneath. Ceramic tile makes cleaning easy as it is not easily stained and can be cleaned with as little as some soap and water — no harsh chemicals needed! When you’re scrambling to get your house clean, your low-maintenance shower tile will help put your mind at ease! Ceramic & porcelain tile include coordinating shapes, sizes, finishes, and textures so that you can customize your shower tile to harmonize with the rest of your bathroom for a cohesive and intentional look. The fact that you can use ceramic tile for your bathroom’s backsplash, walls, floor, and ceiling, in addition to your shower, makes coordinating simple. Choose a consistent color and pattern for the whole space, or a contrasting design for your shower tile that will make it the bathroom’s main attraction. Ceramic tile has one of the longest lifespans and lowest life cycle costs of any flooring option, and its durable, hard surface won’t easily scuff, tear, dent, or puncture. Your shower tile choice will withstand daily use and look great for years to come. Now that you have everything you need to know, stop by and shop our expansive collection of tile! We have over 500,000 ft in-stock today with all the colors and styles you need to make your dream shower a reality!